I have been absent from this blog and most of social media since mid-October when the path of my life took an unexpected turn ~ my love and mate Dudley suffered a stroke that nearly ended his life. Dudley and I (and our tribe of family and friends) have spent the past three months focusing on his well-being and healing. I had alluded in a Facebook post last August 14 to a health crisis that Dudley experienced that we considered a gift ~ because it made us aware of how precious our time together was. It also inspired us to re-commit to slowing down, savoring life, and enjoying one another’s company. Out of respect for Dudley’s privacy, I didn’t share the details of last summer’s health crisis. Now, it seems fitting to do so, as the impact of both strokes on our lives is significant. Dudley had a small stroke last July. He had just passed the critical 90-day mark from the July stroke, complete with scans and tests and a thumbs-up from his neurologist, the day before he had the really severe stroke in October. He has been in hospitals and rehab centers ever since, working on regaining strength and mobility. He is not yet back home, but that is the next milestone that we’re working on. 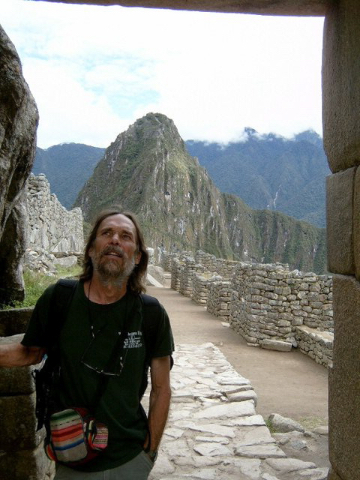 An unexpected and powerful gift of this experience has been the incredible outpouring of love, support, and practical help from family, friends, neighbors and even strangers ~ people with whom I’ve dealt to take care of Dudley’s many business concerns. The kindness and goodness of people has added a transformative element to an otherwise hard experience. I have decided to take a sabbatical in 2017 from offering events, tours, and investigations in order to focus on Dudley and his healing. I hope and expect to be back with a full schedule of Annie Wilder’s Haunted Tea Parties and Spirited Schoolhouse events in 2018. I decided last year to close the door on Inkswiggler, my editing and publishing consulting business, and am happy to refer all editing and ghostwriting inquiries to my mega-talented friend Sally McGraw. 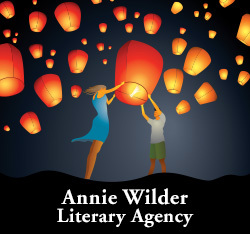 I am keeping the Annie Wilder Literary Agency in place. And, I am continuing to work on my next book, a follow-up to House of Spirit and Whispers. And in case you’re wondering about the spirits ~ I alluded earlier to the kindness of people in our lives. The spirits gathered round, too, after Dudley’s stroke; I felt their presence nearly constantly in the first weeks especially, when Dudley’s health was most precarious. Dudley came to see me in a dream on his first night in the ICU. We both remember this. (He was not often conscious for more than a few moments at a time in the first few weeks in ICU.) Dudley’s energy or spirit also visited our house in the first week or after the stroke to offer some familiar help. I will write about these experiences and other powerful and comforting mystical experiences that occurred during Dudley’s recovery in another post. Watch for new posts around the time of the new moon each month, as a theme for our household this year is renewal and hope. Happy Equinox, everyone! Saw an industrious spider spinning her web in last night’s wild wind and was impressed by her determination. The Equinox, a time of balance, is a perfect time to reflect, take stock, and see what to keep and what to release from one’s life. After working hard this spring on remodeling projects, much of my time this summer was spent on literary agenting work and family events/endeavors ~ both are important to me and, despite being very busy, it has been, overall, an enjoyable and satisfying year. One family project that I feel really good about was getting all of our family movies and videos from the 1950s, 60s and 70s digitized. I had DVDs made as well. I’ve been trying to get things taken care of that have been “on my list” for awhile ~ maybe it’s my age. One thing I decided to release from my life is my editing work and my editing business, Inkswiggler Editing and Publishing Consults. This will free up more time for both my own writing (very happy about this!) and my agenting work. I will be referring all editing requests to my longtime friend and colleague, the immensely talented Sally McGraw. Still in the works for this year: freeing up more leisure time to spend with Dudley, especially traveling and outdoor excursions like kayaking and canoeing. 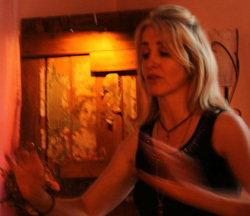 I’m very pleased to announce a new Annie Wlder’s Spirited Schoolhouse event: Your Soul’s Wisdom: Past-Life Regression with Psychic Intuitive Chanda Parkinson. Chanda offered a past-life regression for me and several members of my family earlier this year and it was amazing ~ very positive and powerful. Many of you have seen my dab my eyes while listening to the very moving messages at the spirit message circles. At this event, I literally cried as I recalled a life as a young orphan boy in Europe (sometime in the 1700s – 1800s, I believe). Everyone at the event had an entirely different and very detailed story or narrative, with the exception of one guest who takes quite strong medication. Non of us had known what to expect going in and we all agreed it was vivid and illuminating. I do recommend that guests come with a friend, due to the emotional intensity of the experience. More details on the event “Your Soul’s Wisdom: Past-Life Regression with Psychic Intuitive Chanda Parkinson” here. I love all the haunted tea parties, but this one was extra special. We had not only three guests that are highly skilled psychics, (sisters Suzanne Worthley, Lisa Eckman, and Suzanne’s daughter Phoebe) but three guests whose great grandparents, grandparents, and great aunt and uncle lived in my house from the 1920s through the 1960s. (Sisters Barb and Kathy and their cousin Bill.) Between the stories that Barb, Kathy and Bill shared about their memories of Leon and the house, and Suzanne and Lisa’s impressions of the spirits and residual energies, we had a fascinating time! To share just a few of the things I learned at the tea: I found out that Leon and his wife used to sit on the side porch, while the upstairs tenants had use of the front porch. It was Barb and Kathy’s grandmother Liz, not their aunt Gertude, who used to sit at the upstairs window and watch to make sure kids didn’t leave church early ~ and who called their parents if they did! Suzanne took a look at pictures of both Liz and Gertrude and said that although they were sisters, their energy was very different. Suzanne picked up on Liz’s sharp intellect and serious nature and on Gertude’s warmth, kindness and sense of whimsey ~ she said Gertrude had a love of flowers and fairies. Gertrude used a conch shell as a doorstop in the parlor, a practice I followed after I heard the story from Barb a few years ago. Last, two things: Bill gave me a photograph of Gertrude and her husband Ted, which I am very happy to have. (I will share it after I make sure it’s all right to post.) And, after Barb told me a few years back that the guest room closet (with a big window) was her grandmas’ sewing room and happy place, I said I was going to put my sewing machine in there. (I do already have an antique sewing table in the closet.) On Monday this week, I came home and found the sleek and beautiful, steampunk-ian Franklin sewing machine pictured here on my back porch, with a note from Barb, saying it belonged to her grandma Liz and she wanted me to have it. I am thrilled and honored, of course. 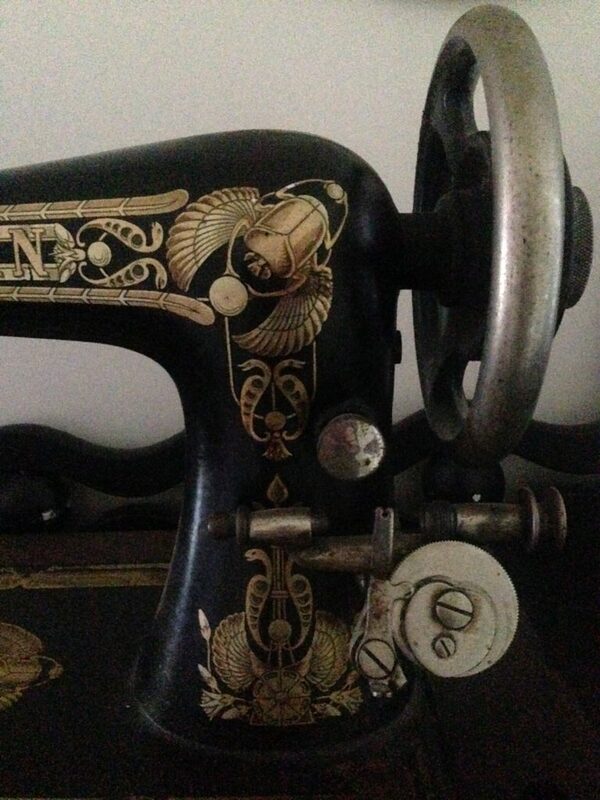 I was intrigued by the Egyptian symbolism on the sewing machine ~ my son told me that it was probably from the 1920s, as that was when King Tut’s tomb was discovered and there was kind of a worldwide craze about it. 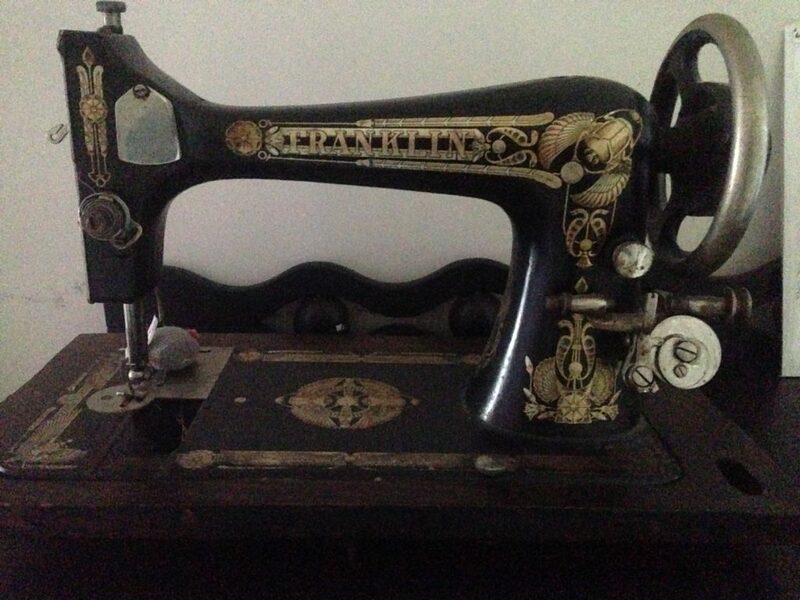 I looked online and found the Franklin sewing machine and it IS from the 1920s. That would explain the unexpected drama of ancient magical symbols on an important, but common, household machine. 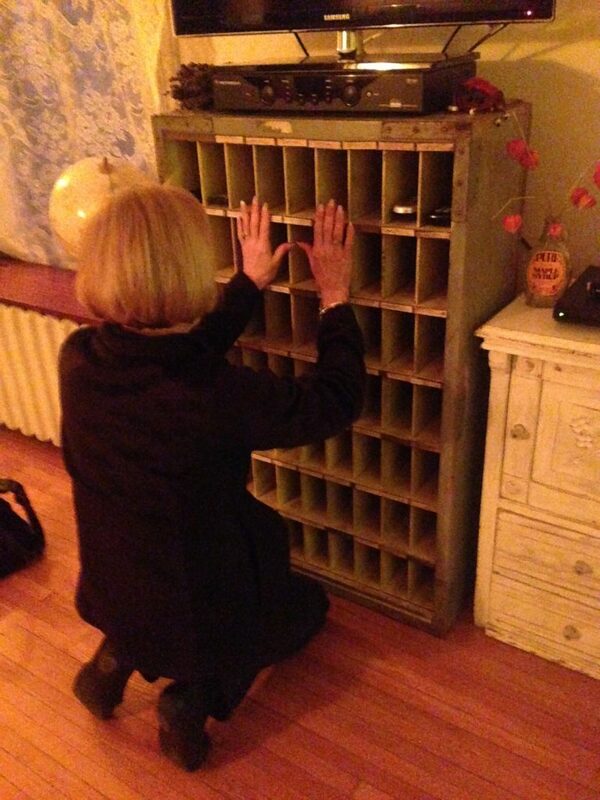 I called Barb and let her know that I will take good care of her grandma’s beautiful sewing machine and that I see it as a permanent part of my house and its story. 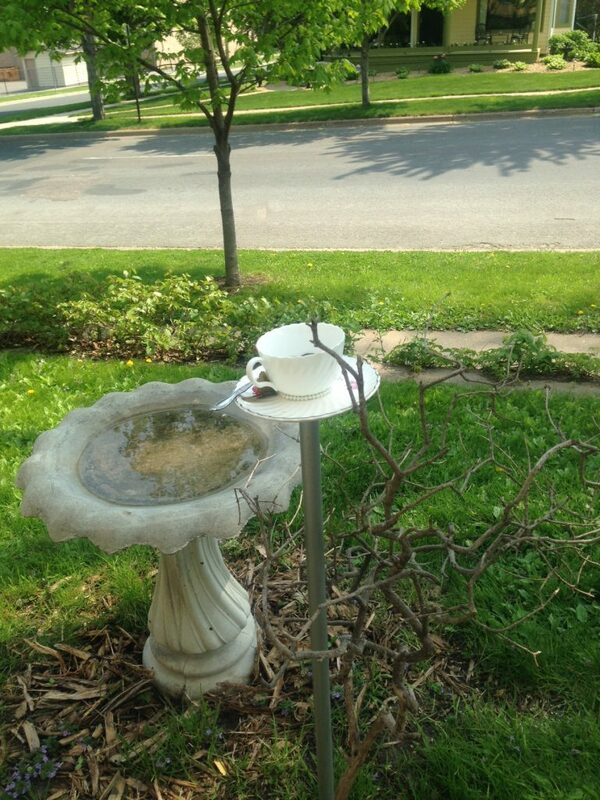 Tea Parties, Crystal Ball Readings & Paranormal Investigations, Oh My! Tea parties and crystal ball readings and paranormal investigations, oh my! Not to mention three radio/podcast interviews…. This June is filled with spirited events and appearances for me ~ hope you can be part of them, as a guest or listener! 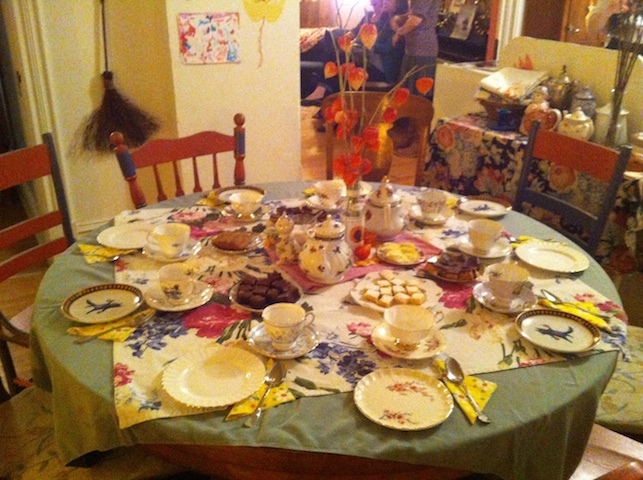 Getting ready today for the season’s first haunted tea tomorrow, June 4 ~ and what a tea party it will be!! Guests include my friends Suzanne Worthley and Lisa Eckman, sisters who are both highly skilled intuitives and energy workers. Also present will be my friends Kathy and Barb (another set of sisters) and their cousin Bill, whose great-grandparents, grandparents, and great aunt and uncle all lived in my house over the course of nearly 40 years, from the 1920s through the 1960s. Kathy, Barb and Bill’s family overlapped slightly with Leon’s time here. (He bought the house in 1963.) They have shared stories of their family’s time in the house that are now part of my tea parties stories and will be included in my next book. My friend Steve R. is bringing his team in for a paranormal investigation on June 10. Steve can be seen in a video on my website from 2010 when he was with a different paranormal group (which has since disbanded). Wrapping up the month will be the brand-new Midsummer Season Crystal Ball Divination with psychic intuitive Eric Moen on June 30. I’m really excited about this event and we have some very cool guests signed up already. There are still seats available, but please sign up soon if you’d like a spot! Will post reports on all June’s spirited events and happenings. As a side note, it seems that the house spirits are interested in all the activity ~ at least, I am aware of their presence and sense their positive and curious attention. I’m really hoping that Kathy, Barb, and Bill’s family spirits drop by for tea tomorrow! 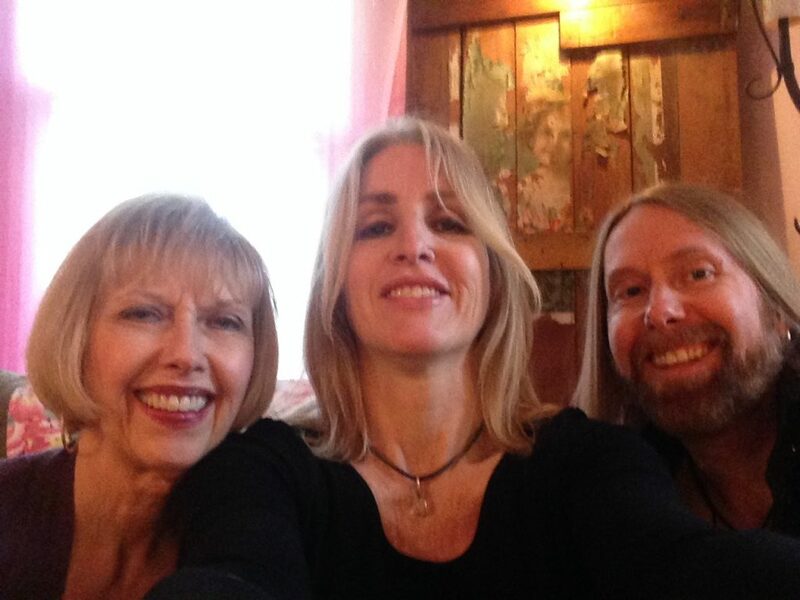 Had a lovely visit last week with my Annie Wilder Literary Agency clients (now friends) psychic medium team Chris Moon and his mom Paulette. They came up from Colorado to wrap up edits on their forthcoming book (more on that in a moment) and be filmed for the 2016 Halloween episode of Life to the Max. Chris was the first person to work with the infamous “Frank’s Box” also known as a Ghost Box or Thomas Edison’s Telephone to the Dead. (Yes, THAT Thomas Edison!) Frank’s Box was the precursor to what are now standard tools of the trade for paranormal investigators, the Schack Hack and the Ovilus. 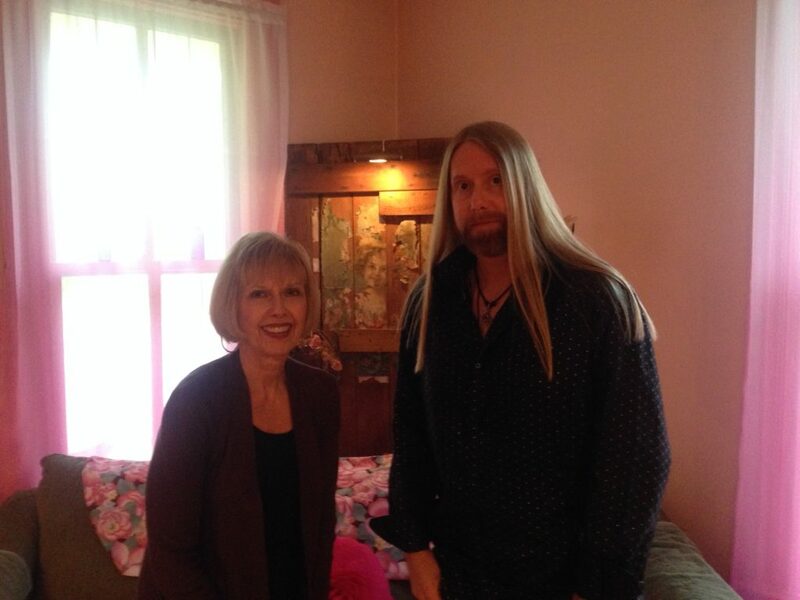 Both Chris and Paulette are extremely gifted mediums ~ in fact, before they even turned on the Ghost Box, they were picking up names of spirits who lived and died in this house. I have never written about three of the spirits they named and the fourth, if I mentioned him at all in my books, had a pen name. They also shed some light on a longstanding mystery that followed almost exactly the narrative provided by another psychic friend of mine (also never written about and rarely spoken about to anyone but a few of my family members). If I am able to verify the information in some way, it will be included in my next book. And speaking of books, I am pleased to announce that Chris and Paulette have written a book describing their fascinating encounters with a variety of spirits and inter-dimensional beings using the Ghost Box. The book’s final title has not yet been decided, but it will be published by Llewellyn sometime in 2017. Will definitely keep you posted on this project! Will also let everyone know the date and time when the Life to the Max episode will air this fall. The reporter for the night was WCCO’s award-winning journalist Liz Collin, which was really an honor. We had quite a bit of spirit activity during the shoot, and it was during the filming that two of the previous owner’s names came though. (First and last names.) If the clip stays in the final piece, you’ll see how shocked I was when I realized what had been said. Also, for those of you familiar with EMF meters, ALL the lights were lit up for approximately 10 ~ 15 minutes. (For those unfamiliar with EMF meters, I am told this almost never happens, even for just a minute.) Another paranormal team that came to my house had a similar experience with their EMF meter. The video from that night that is on my website, “Ghost Busters: The TIPS Crew Investigates Annie Wilder’s House” ~ Life to the Max Show, 2010. Happy Mother’s Day to every woman who shares her creativity and caregiving skills with the world, whether her love is directed toward children, those in need, animal companions, or the natural world and planet. My thanks to the all the guests who were part of our Mothers’ Day Spirit Message Circle on Thursday, and special thanks to intuitive Linda Cora, who did an incredible job, as always. 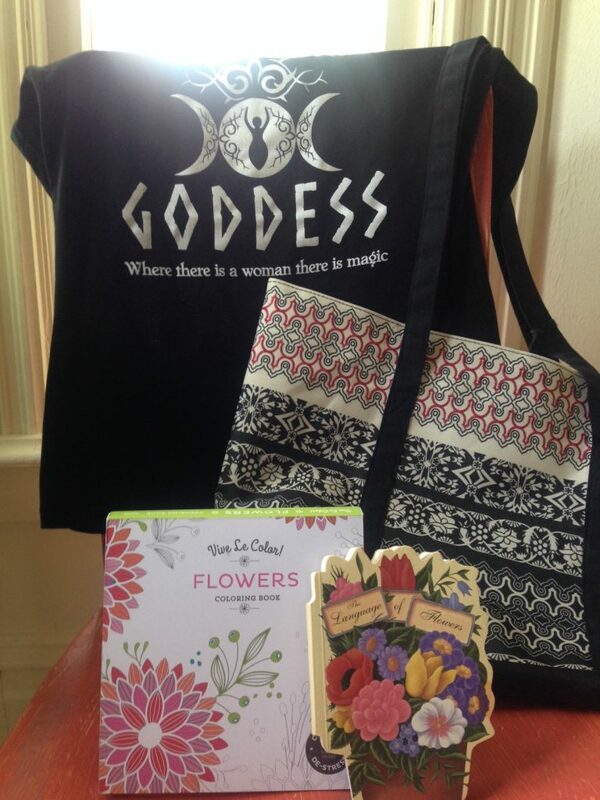 I’ll post the highlights of the Spirit Message Circle event tomorrow, but wanted to thank my talented friends Linda Cora, Diana Stinocher, and Kathy Johns for the lovely and thoughtful gifts, pictured in this post. 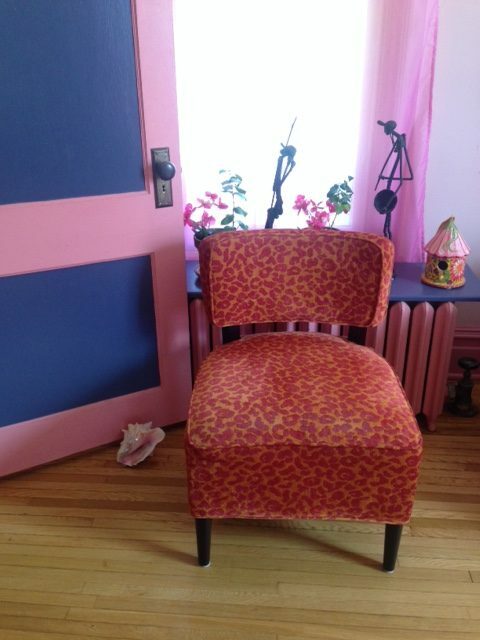 Thank you, too, to my friend Lisa Faribault for taking the fantastic pictures of my house! I’ve been working out in the yard for the past few days, spending most of the day outside from right after breakfast till past the time when I would usually eat supper. This is one of the patterns of spring for me; I am so happy and feel so restored by being out in the beautiful, budding and blossoming world that I don’t want to stop to eat or tend to indoor tasks ~ it is only the darkness that sends me back in the house; when there is no longer enough light for me to plant or dig or trim. 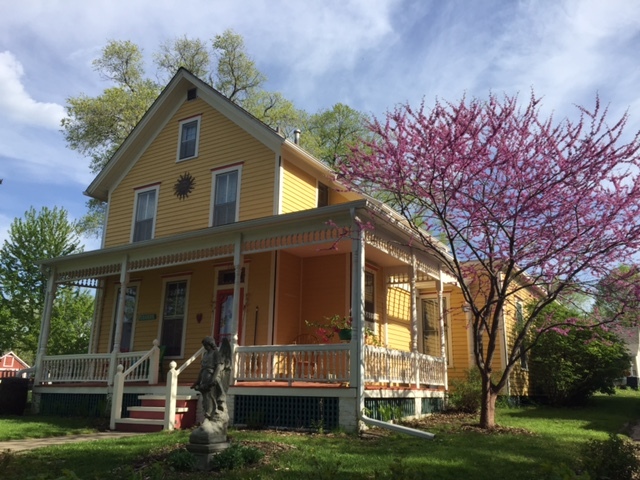 Part of what I love about this time of year in Minnesota are the colors ~ the lush and soft green grass, the vivid pinks of the redbud blossoms and clean white petals of the plum tree blossoms, especially when set against a slate gray May sky. 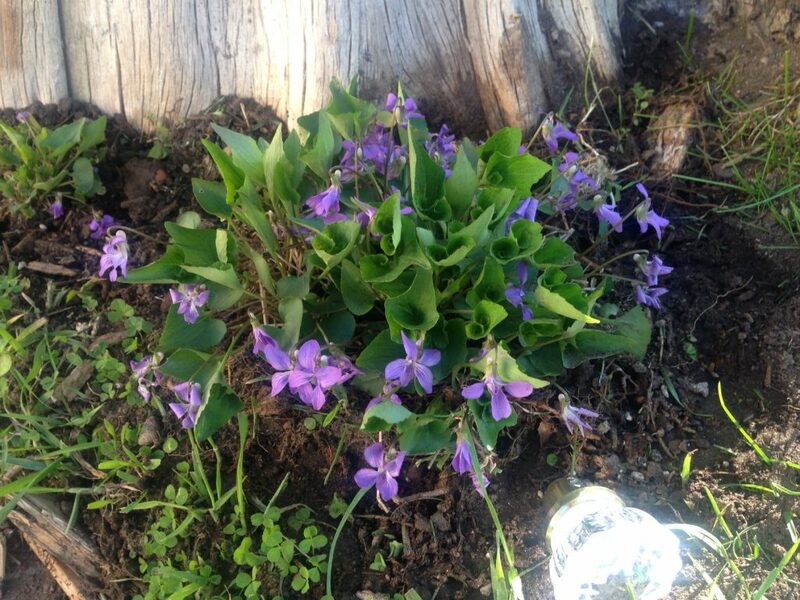 This year, along with the gift of inner peace and a deep sense of gratitude for our beautiful planet, my backyard surprised me with an abundance of cheery and hardy violets (one of my favorite flowers) that popped up in last year’s tiny buckwheat field. We’re planning to put raised garden beds in this sunny former buckwheat patch, so I’ve been transplanting violets all over and they now brighten up many corners of our yard. 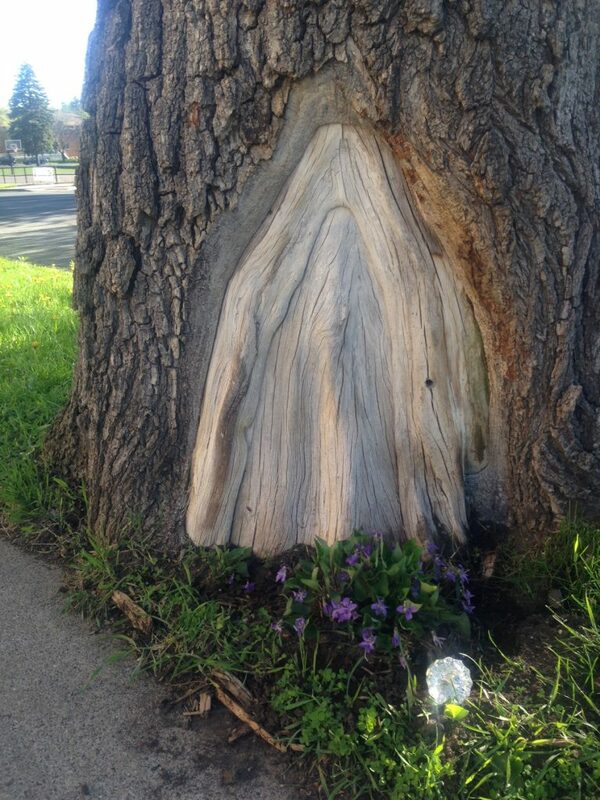 My friends, dowser Curt Hansen and psychic Vonne Jonsson, stopped by Monday with a faerie house for me. Curt and Vonne have started a business called FaeryBlossoms, and these metaphysically talented and knowledgeable friends sell faerie houses that they make themselves. They also offer faerie events, faerie message readings, and tours of places where faeries can be found. To find out more, visit Curt and Vonne’s website: Faeryblossoms.com. What Makes a Haunted House Happy? What makes a haunted house (or at least it’s physical world steward) happy? 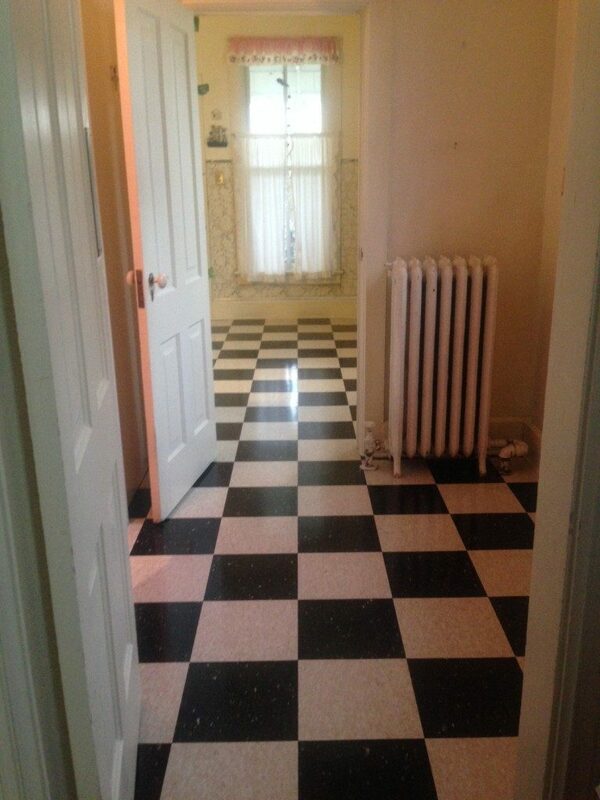 A brand new, sparkling clean checkerboard floor, that’s what! 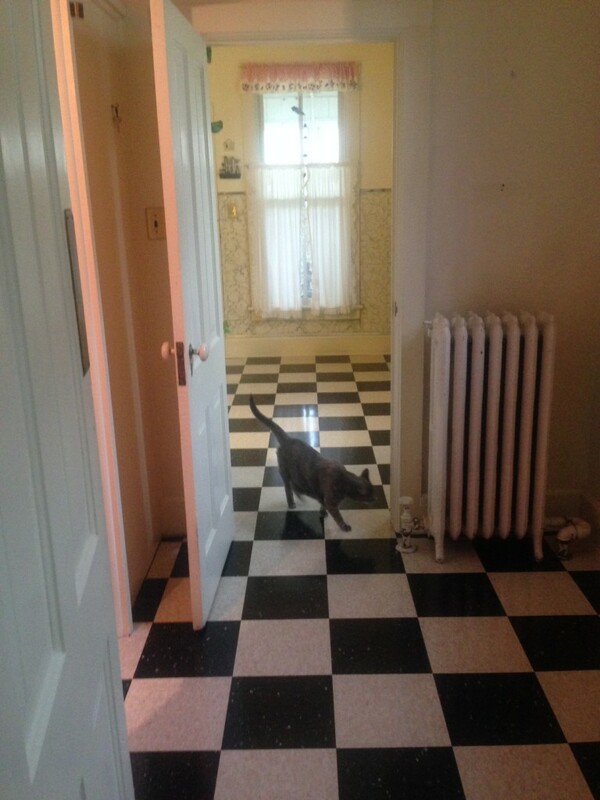 Doing the happy dance now that we have a charming and fittingly vintage-looking floor in the summer kitchen, back hall, and back bath. The pretty antique stove can return from its backyard exile, the clothes dryer can be brought in from the porch, and I have already gotten the pie table and Christmas cactus set up by the window. I said “Yes,” and asked him what Leon had done to let them know he was around. He told me that the dryer vent kept flapping loudly while they worked and the smoke detector went off several times. Now Leon has “spoken” to me before with the smoke detector ~ in that instance (which was years ago), I sensed Leon’s presence in the back hall and asked if he was there. The smoke detector responded with a few quiet beeps. I told Leon hello, thanked him for his help with the house, and waited to see if the detector would keep beeping. It didn’t and the battery did not need to be replaced for months after that. The other funny thing is that the fellow who actually installed the new floor ~ a man of very few words ~ must have had the same experience that the floor polishers did, because when I arrived home after his first day working here, the smoke detector cover was sitting on the summer kitchen counter and the battery was pulled out enough so that it wouldn’t work. Neither Dudley nor I have heard the smoke detector alarm go off or even chirp for years. We even tested the battery last week to make sure it worked before putting the smoke detector back together. It made me happy to know that Leon was watching over the work and the house and letting the guys know, in a friendly way, that he was here. In CRYSTAL BALL NEWS, I had an interesting and very enjoyable crystal ball divination session in my parlor on Monday night. 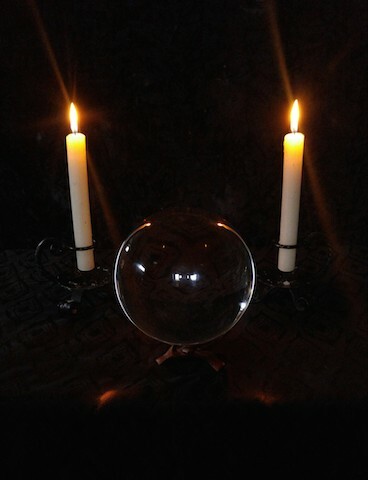 We set up a small table in the parlor and Eric placed the crystal ball on it and lit two candles. First surprise: the ball has a name! Eric introduced the ball to me ~ since I’m not sure of the etiquette of me sharing the name, I’ll refrain from doing so ~ but I will say that the name seemed to suit the ball, which was large, dignified, and a bit aloof. Eric also shared the story of how it took for him to get the ball to work with him ~ three months ~ and yes, there was an initiatory experience of sorts. The first image to appear was two owls, which is cool, because the owl is one of my totem animals. Then Eric said something to the effect that two male spirits were standing behind him in the parlor, to check him out and see what his business in the house was. I knew from the language used and the purpose of the visit that one of the spirits was Leon. (Which made me happy, as it always does when Leon looks after things.) Not sure who the other spirit was, though, and would like to find out. Other spirits showed up, too: a riverboat captain, a Frenchman associated with the property, an old-fashioned young woman, who I believe may have been one of the spirit sisters, some elementals (or earth spirits) but the only spirit who showed Eric her face was Cherry, our sweet dog that we had to say goodbye to a few years ago. Eric noted some things about the earth spirits on the property that resonated with me and fits into some of the topics/experiences I’ll be exploring more in my new book. (My new book on which I am ~ slowly ~ making progress.) One tidbit: Eric described an elemental being that I have seen here and even sketched a picture of. One of the coolest things was that, when the reading started, Eric said, “Everything coming through is about your house and its energy, not you!” I told him that was perfect; I wanted to know what the crystal ball had to say about my house because I could use it all in my book. Another cool moment was when Eric started to talk about a chair that had been in my house, I not only clearly “saw” the chair in my mind ~ it was an ornate wooden ceremonial chair ~ but I also saw where it had been in my parlor. If you’d like to be part of a crystal ball reading event, please join Eric Moen and me on Thursday, June 30 from 7:00 ~ 9:00 PM. More details, including how to sign up, can be found here. COPYRIGHT © 2019 Annie Wilder Enterprises, LLC. ALL RIGHTS RESERVED.